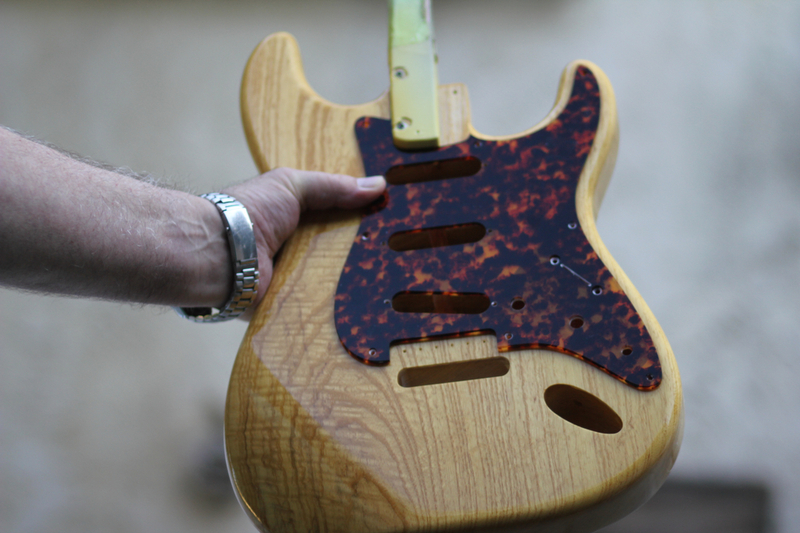 Out of a modest, overflowing workshop in California’s San Fernando Valley, Michael DeTemple crafts some of the most exquisite Strat and Tele-styled guitars imaginable. DeTemple was a professional guitarist for decades (among his noteworthy gigs, he played alongside Rick Danko of the Band, on Dave Mason’s Alone Together and on the Bonnie and Clyde soundtrack). 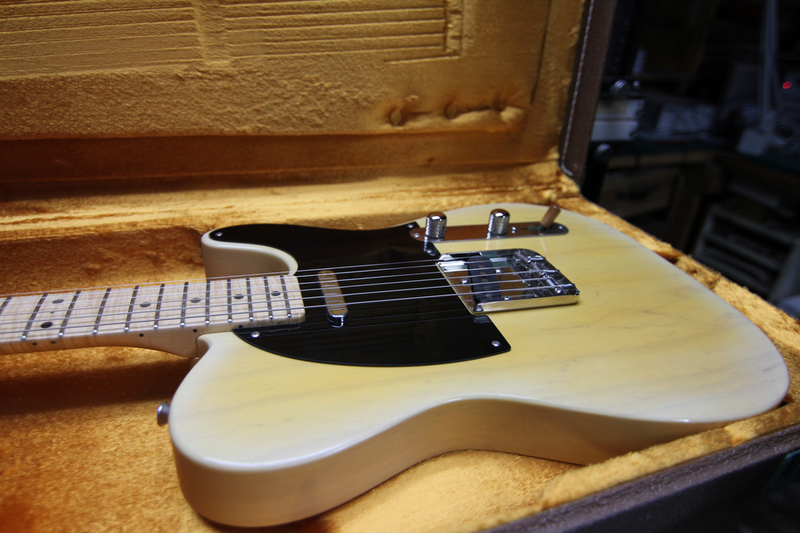 Today, his creations pay homage to his favorite Fender guitars from the past, with a few new tweaks and improvements. Titanium tremolo blocks and saddles, fossilized mastodon ivory nuts and his own SweetSpot pickups are just a few DeTemple touches you won’t find anywhere else. 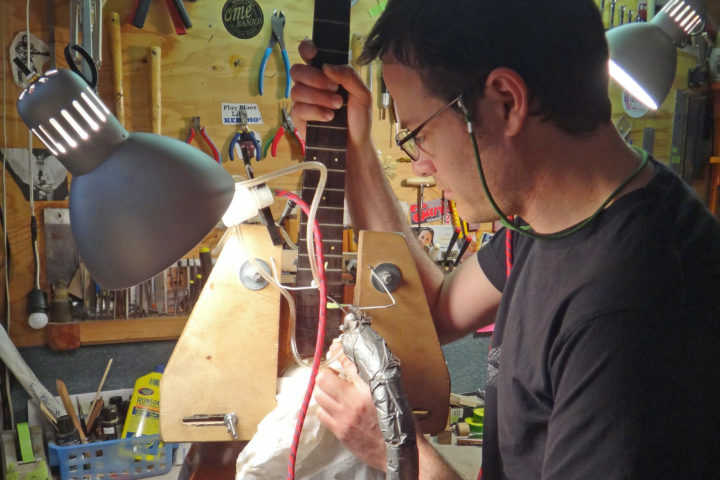 We caught up with DeTemple and his handful of employees (a few of whom are also members of punk-bluegrass band Old Man Markley) in September 2010. 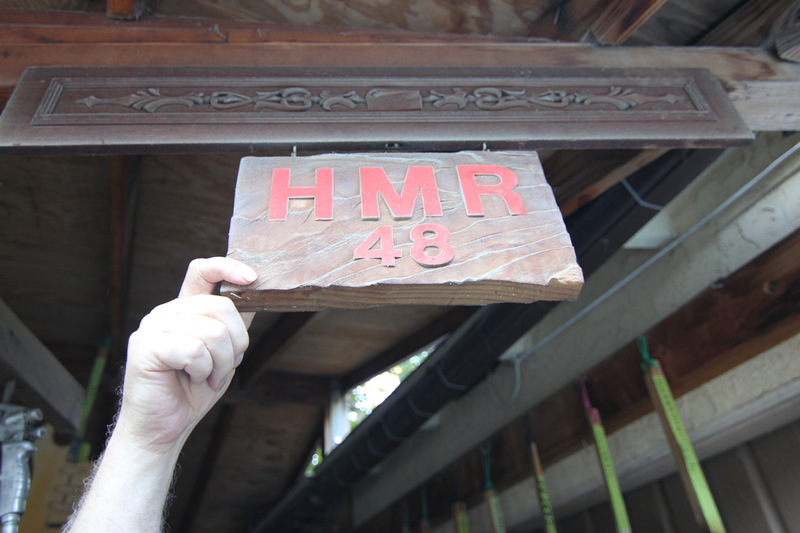 DeTemple points to the HMR sign hanging outside his workshop. It formerly graced High Mesa Ranch, a property outside Taos, NM that belonged to his wife’s family. The ranch is now owned by actress Julia Roberts. DeTemple likes to experiment with “tanning” his instruments by exposing them to the sun for a period of time. 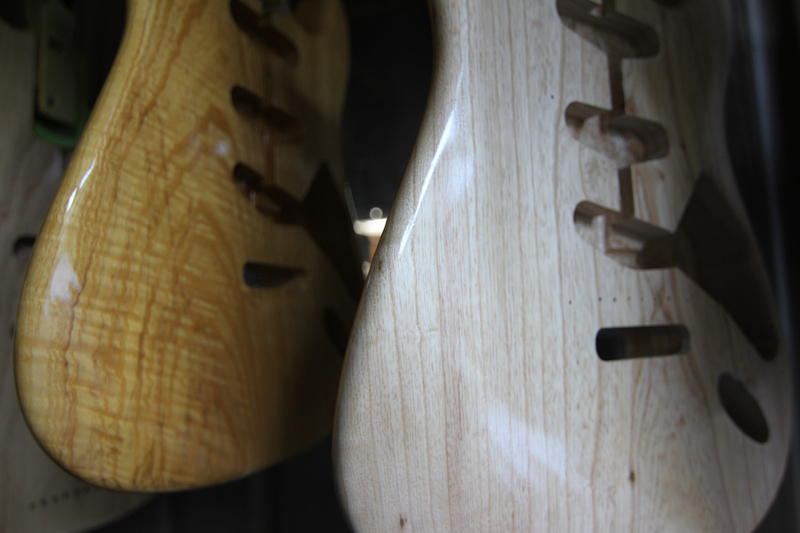 The guitar body on the left, believe it or not, has the same finish as the one on the right. It was just hung outside, catching rays, for nearly a year. 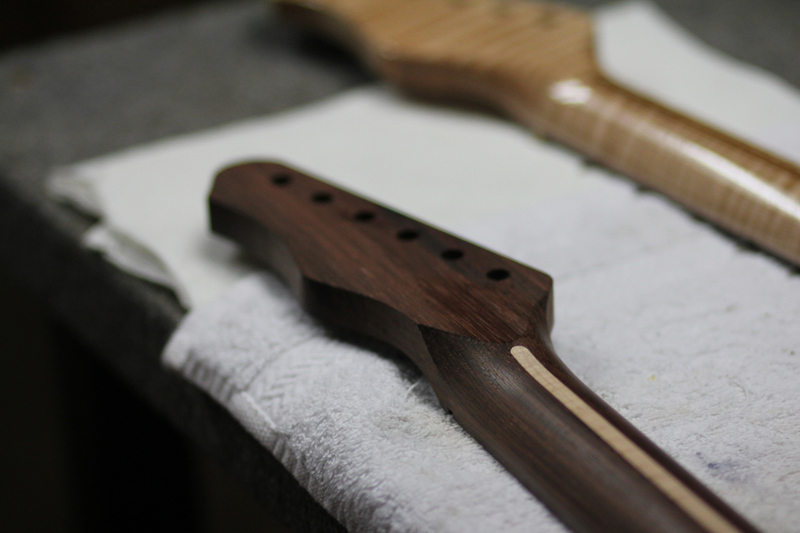 Yes, Virginia, that is a one-piece Brazilian rosewood neck. 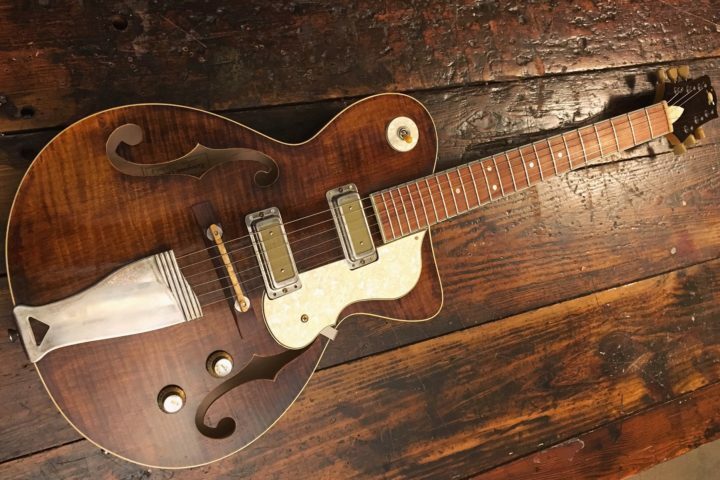 Not your run-of-the-mill option but we’re dying to hear how it sounds. DeTemple stabilzes a nice stockpile of wood for necks. He insists on using one-piece, quarter-sawn flame maple for the job. 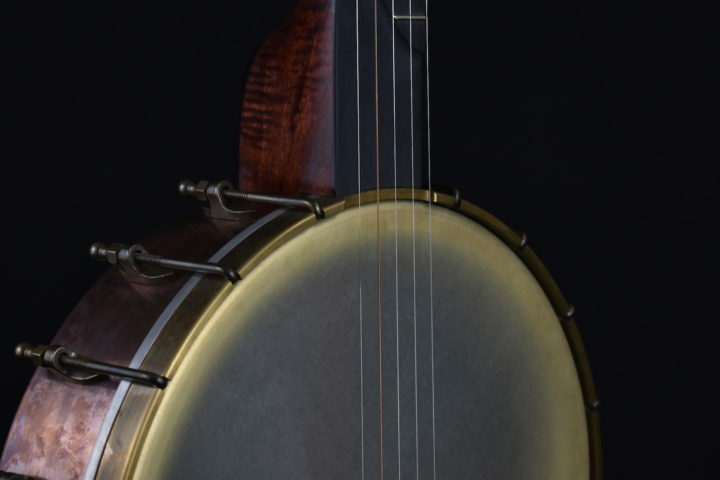 As a kid, DeTemple, along with David Lindley, was a regular competitor of the Topanga Canyon Banjo & Fiddle Contests. 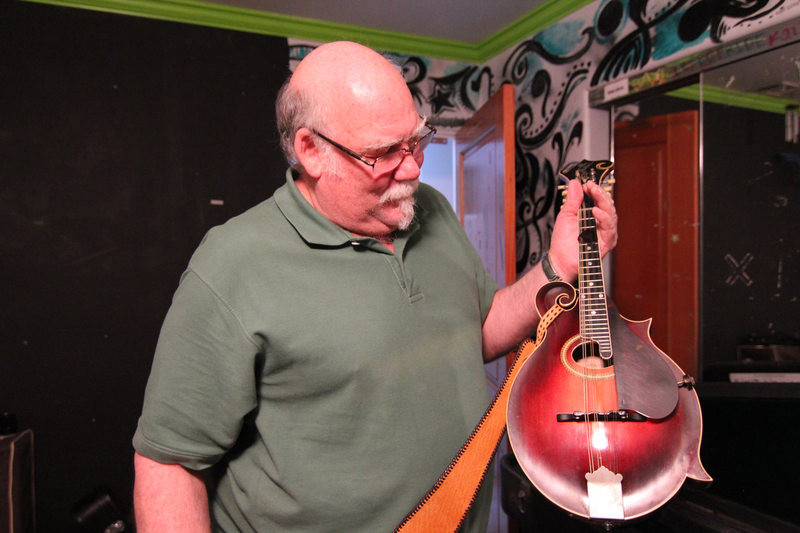 He still plays the banjo from time to time and, during our visit, he showed off one of his prized possessions: former banjo great Eddie Peabody’s old Gibson mandolin. 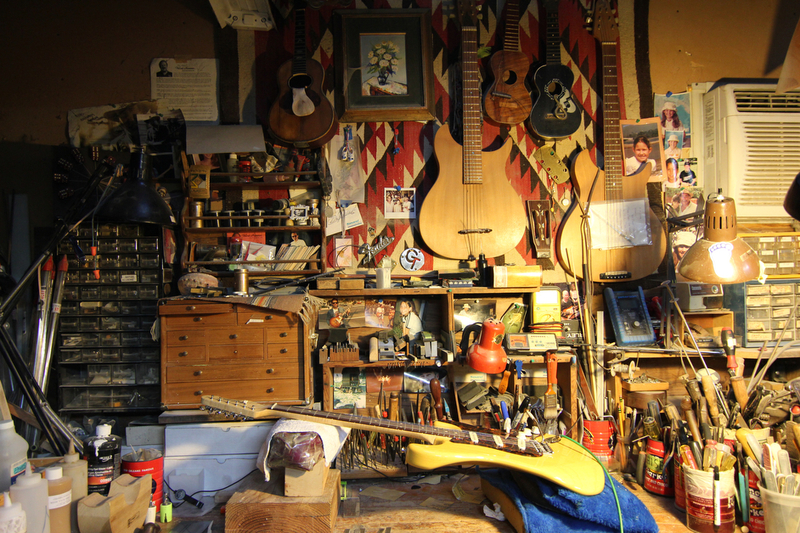 As with most every luthier we meet, there’s an inverse proportion to the cleanliness of the workbench and the cleanliness of the finished guitars made on said bench. 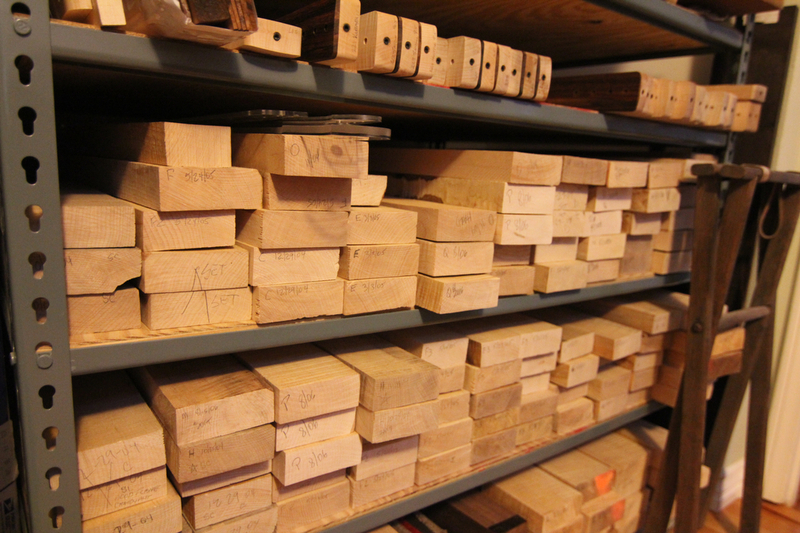 DeTemple is a big proponent of titanium parts, including trem blocks, saddles and now back plates. 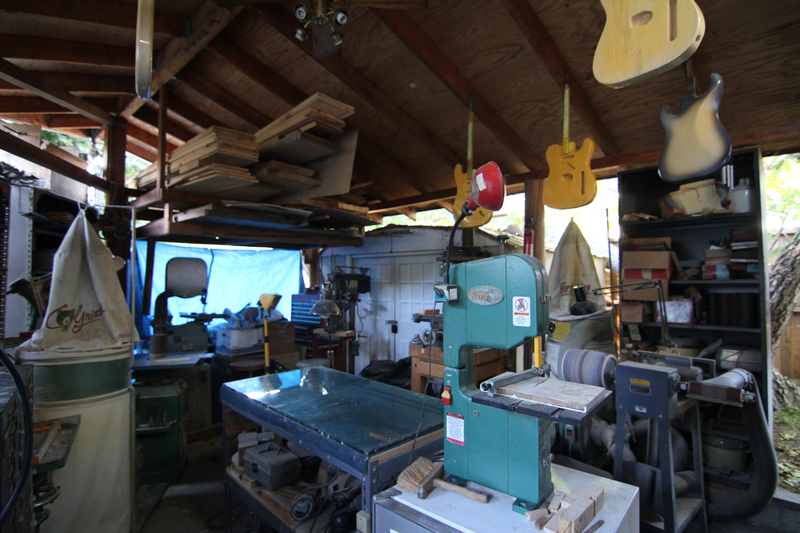 Thanks to Southern California’s mild climate, DeTemple’s workshop has been able to overflow to the carport outside of his main building. 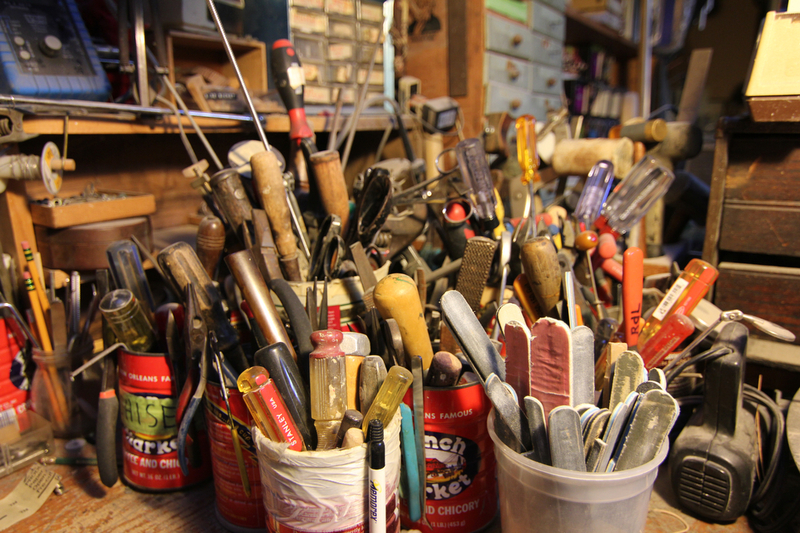 Here, some rough cutting and sanding takes place. 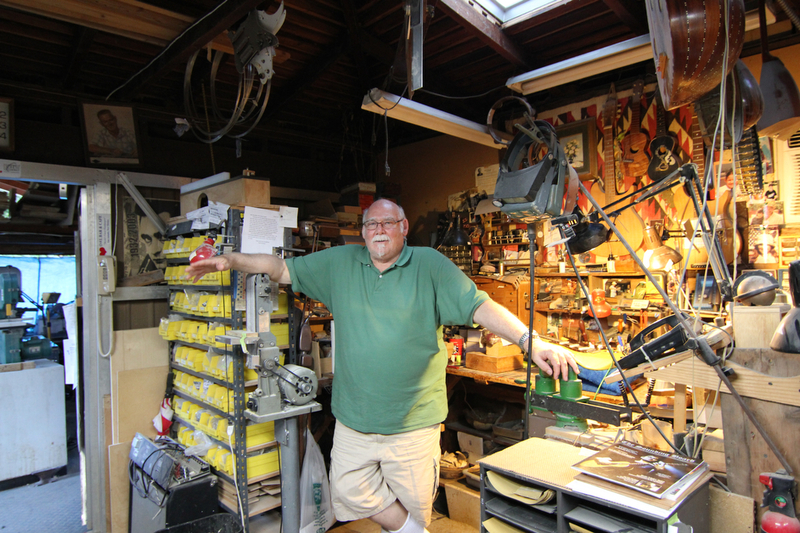 Mike DeTemple at his Southern California workshop. 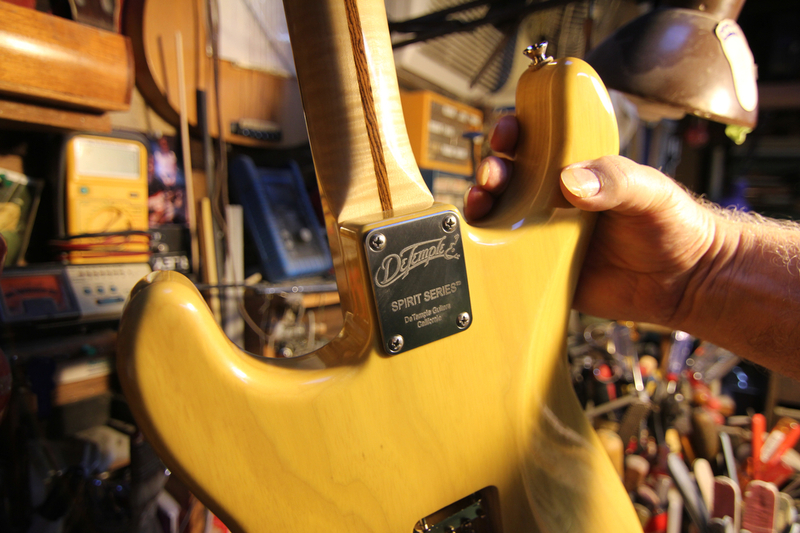 A DeTemple ’56 gets a final inspection on the workbench. Hanging above are two solid body acoustic guitars DeTemple built for John Fogerty.